Porter Wright is proud to announce that attorney Jyllian Bradshaw has joined the firm as Senior Associate in its Labor & Employment Department. Prior to joining Porter Wright, Bradshaw served as legal counsel for Dayton Public Schools. 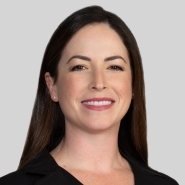 Her background and experience enable her to provide practical and strategic advice to clients with respect to their employment issues, labor relations concerns, education policies and procedures, as well as with collective bargaining matters. During her time with the school system, she participated in extensive collective bargaining proceedings and counseled the Board, Superintendent, Treasurer and Human Resources department on all employee-related matters. Bradshaw’s industry background includes serving as a high school teacher in Orange County, Florida, where she taught language arts and ethics. Bradshaw received her B.A. from University of Central Florida in 2006 and her J.D. from the University of Dayton School of Law in 2012. The hiring of Bradshaw is the second for Porter Wright’s Dayton office in 2018, bringing the total number of attorneys in that office to 12.